Charles W. Canney Camp No. 5, Sons of Union Veterans of the Civil War, is a non-profit organization in Rochester, New Hampshire, dedicated to preserving and promoting the Civil War and the Union Veterans. One of the biggest projects the Camp has done in the past was to help the communities of New Hampshire raise the funds and awareness needed to restore their Civil War Monuments, or the creation of new memorials. In 2004, there were around 61 Civil War monuments throughout the state; a few communities have more than one. The Camp was able to secure a grant from the Sons of Union Veterans of the Civil War to help restore the Portsmouth Civil War monument. It was re-dedicated in 2003. 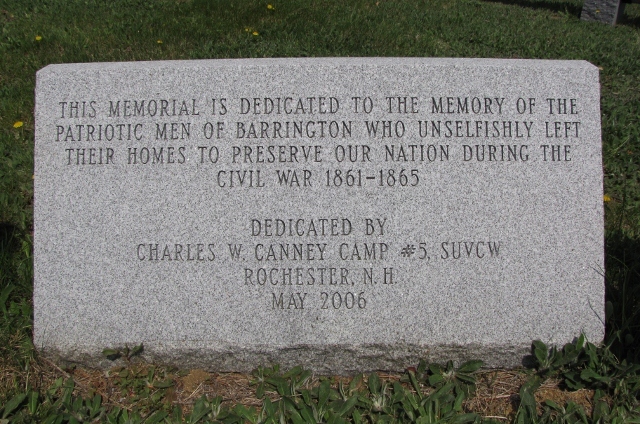 (on right) Barrington, New Hampshire's Civil War Soldiers Memorial, dedicated in May 2006. The restoration of Candia's Soldiers' Monument took place in 2007, with the re-dedication taking place on Veterans Day.